America is now giving money to terrorists. 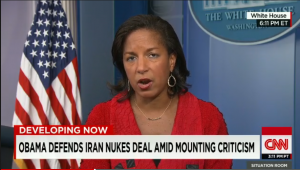 National Security Adviser Susan Rice said “we should expect” that some of the money Iran gets under sanctions relief as a result of the nuclear deal “would go to the Iranian military and could potentially be used for the kinds of bad behavior that we have seen in the region” on Wednesday’s “Situation Room” on CNN. Rice was asked about the money Iran will receive under sanctions relief and how they can use it, she answered that the sanctions were only put in place “to prevent Iran from getting a nuclear weapon.” She added, “Our best judgment is, first of all, it’s going to take them quite a while to access that money. And it will take — they won’t be able to get it all at once.